Regular visitors will have noticed that apart from one entry in January, I have not been updating this blog since the middle of December. One of the reasons for this is that I am currently immersed in writing a book about HIV and the criminal law for the UK HIV information charity, NAM. In fact, I started the blog with this book in mind. 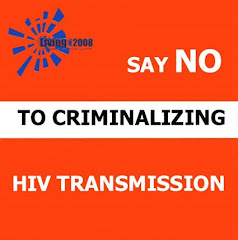 The book is an examination of laws, arrests and prosecutions for HIV exposure, non-disclosure and transmission around the world, and the issues that surround them: risk of exposure/transmission; whose responsibility? ; concepts of harm; proving a case; and the impact of these arrests and prosecutions. Rest assured, I am still tracking reports from all over the world; and still welcome information about advocacy, publications and unpublished cases during my hiatus, which should end in mid-March when the first draft of the book is completed. Catching up isn't going to be easy, but I will do my best. In the meantime, there is a wealth of information on this blog which everyone is welcome to use.